I never thought I'd say this, but Zack & AJ are pretty much done with Dora the Explorer. The love affair has ended. They have obsessed over her since they were 2 years old. We have every DVD she has ever made, and the few episodes that don't appear on a DVD we have DVR-ed. We have THEM ALL. We have seen them all so many times that we play a little game where when an episode starts, if we've managed not to check the guide to see which one it is, we'll challenge each other to be the first to guess the episode. Within seconds of the opening theme song ending, one of us can correctly name it. We've noticed little things only someone who has seen Dora the Explorer every day for the last 3 years could notice. Things like the little crush Isa has on Boots (notice how when Isa enters a scene, she says "hi Dora" in a normal voice and then says "hi, Boots..... like she's so shy and self-conscious all of a sudden! This happens in more than one episode. I can name them for you if you are interested.). And how funny it is when Benny the Bull accidentally turns himself into a big potato and how Dora and Boots strain and struggle together to lift Benny (now a potato with a Benny-head) into a wagon, but later when Swiper comes along as he inevitably does, he lifts Benny and throws him quite a distance, as if he weighed next to nothing. Swiper is just super-strong, I guess. I could go on and on here but I'm guessing enthusiasm for funny Dora the Explorer observances is limited. 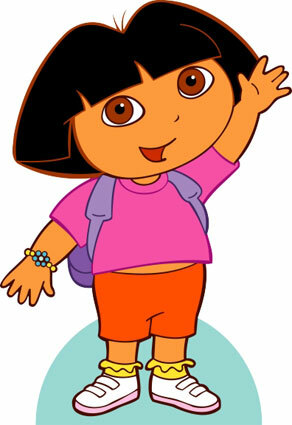 But really, Dora has been a wonderful part of our lives over the years. She gave AJ an outlet for some new words he'd learned. One of his first words was "map", which he'd shout repeatedly when it came to that part of every show. "Who do we ask for help when we don't know which way to go?" "MAP! MAP! MAP! MAP! MAP! MAP!" But we are at the end of the Dora era. Now when I turn on Dora Zack looks from me to the TV, shaking his head and looking pained, and says "buh-bye! buh-bye!" And sometimes a mournful, just-this-side-of-whining "no...." And if I ask him "Do you want Diego?" He responds exuberantly "yeah! yeah!" This happened at some point in the last month or so. 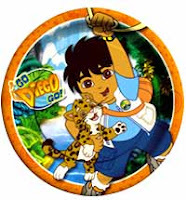 Zack has decided that Diego is the new Dora. It's starting out much the same as the Dora obsession did; there are a few episodes he's obsessed with, and the rest we have to bribe him to watch so that we don't go batty from watching "Three Little Condors" or "Save the Red-Eyed Tree Frogs" one more time. A week or so ago, AJ was neither pro nor con Diego, but he's warming up to it. Which is only fair and as it should be, since AJ's crush on the Wiggles is the only reason Zack likes them, too. So as of today, AJ's fave is the Wiggles, and Zack lives for Diego, and Dora is left out in the cold. Buh-bye, Dora! I, for one, will miss her. Lucky for me, she visits Diego sometimes to help him out on his adventures, so I'll get to check up on her once in awhile.